STAT!Ref® Mobile takes STAT!Ref healthcare e-sources on the go. With powerful, interactive functionality, it allows users to search their institution’s subscriptions anytime, anywhere. STAT!Ref is available through mobile applications that are supported by most popular devices. STAT!Ref Mobile uses Wi-Fi and common browser connectivity, which allows users to access their institution’s subscriptions anytime, anywhere or users can choose from one of our featured Apps. To use the app, all a user needs to do is create and enable a “My Stat!Ref” account through their subscription and then download the free app and log in. The STAT!Ref Mobile App uses the same intuitive, full-text e-resources as STAT!Ref Online that enable users to cross-search evidence-based and authoritative references in seconds. • Access the STAT!Ref subscription and setup a "My STAT!Ref" account before attempting to use one of the available apps; STAT!Ref iPhone and iPad App or STAT!Ref Android™ App. • After setting up a "My STAT!Ref" account you need to activate the "Temporary Login Account". The Temporary Login Account enable's your My STAT!Ref user name and password to log you in through the app. • Download the app suitable for your device. • The STAT!Ref Android Mobile App is available on Google Play™ - click here. • The STAT!Ref Android Mobile App from the Amazon App store - click here. • The STAT!Ref Mobile iPhone & iPad App can be downloaded FREE from the iTunes App Store - click here. STAT!Ref Mobile App Access takes STAT!Ref healthcare e-sources on the go. 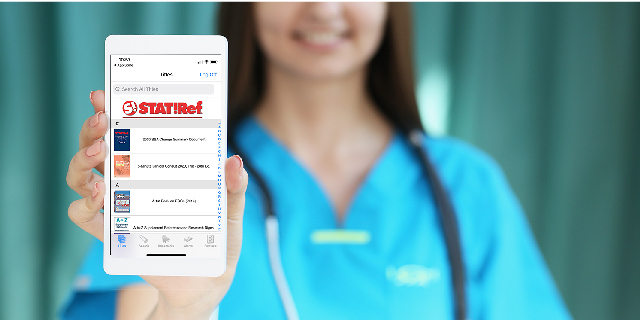 With powerful interactive functionality, STAT!Ref Mobile App Access allows users to search their institution’s subscriptions anytime, anywhere. STAT!Ref is available through Mobile Apps that are supported by most popular devices. 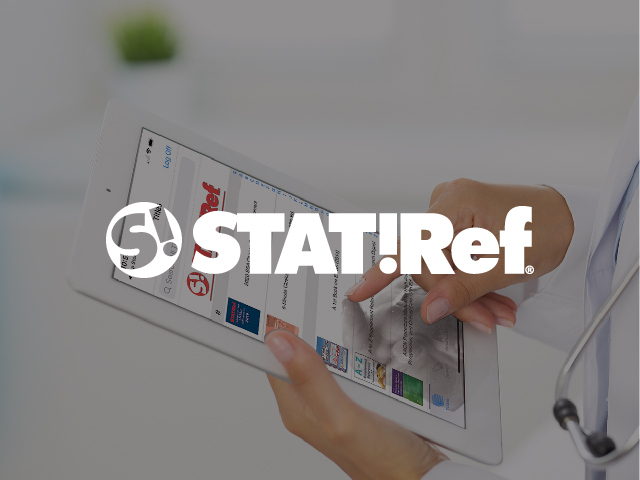 This free app ensures that you will get the most from STAT!Ref database content provided courtesy of your subscription or your institution's subscription. • Access all of your core STAT!Ref content in a convenient format designed specifically for your Android device. • Search your library's entire database, or search only in a specific title. • Bookmark specific paragraphs so you can quickly find that exact spot again later. • Quickly define unknown medical terminology using your included medical dictionary simply by tapping the Dictionary Look-up button and choosing a term. • Quickly jump around large documents using the local "Contents" panel. • Access all of your core STAT!Ref content in a convenient format designed specifically for your iPad, iPhone or iPod Touch. • Quickly define unknown medical terminology using your included medical dictionary simply by highlighting the word and tapping "Define". • Pick up right where you left off, even after the application is closed. • Listen while your device reads the text to you aloud using Text-to-Speech. • View the latest Evidence Alerts and Reuters® Medical News Feed articles, and optionally receive push notifications when new articles become available. Creating a My STAT!Ref account personalizes your institution’s STAT!Ref subscription to make it unique to you. With a My STAT!Ref account, you can create a customized experience with favorite documents or searches, recent searches, mobile access, e-mail alerts and much more. • You have to access the STAT!Ref subscription and setup a "My STAT!Ref" account before attempting to use one of the available apps; STAT!Ref iPhone and iPad App or STAT!Ref Android™ App. • After setting up a "My STAT!Ref" account you must activate the "Temporary Login Account". The Temporary Login Account enable's your My STAT!Ref user name and password to log you in through the app. PLEASE NOTE: My STAT!Ref and Temporary Login Accounts can only be created, activated and renewed while you are officially logged in through your STAT!Ref subscription. This cannot be done through or while logged in from the app or from anywhere else you have logged in using your My STAT!Ref user name and password. Step 1: Access your STAT!Ref subscription as you normally would using an official login method. This would be authentication based on the IP addresses of your institution and/or full user accounts usually via a desktop or laptop computer while at your institution or through a proxy server login (using your institutional login). Step 2: Click the “My STAT!Ref” link just above the [GO] button in the search bar. Step 3: Enter an email address. The email address you enter becomes your User Name and must be entered in its entirety. The email address can be personal (i.e. gmail, icloud, AOL, Hotmail, etc...) or institutional (i.e. Org, Edu, Mil, Gov, etc...). Step 4: Click the: No, I want to create a My STAT!Ref account. Step 5: Click the: [Log in/Create Account] button. Step 6: Enter your information in the short form. Step 7: Create and confirm a password. The password is a password of your choice and must contain at least 5 characters which can be a combination of; alpha, numeric, upper case, lower case and basic special characters. Your password is case sensitive and must be entered just as you created it. Click the [Create Account] button. After the “Account creation successful” message you will be on the Alerts page. At this point you have a My STAT!Ref account profile. Check out the Account Features and Functionality section for all you can do with this account. To activate your My STAT!Ref account as a login and for use with the app proceed to the next section. Step 1: Click the [Temporary Login Account] tab. Step 2: Check the reCAPTCHA box and answer the security questions if asked (you may be asked a series of questions). Step 3: Click the [Activate/Renew] button. Step 1: Access your STAT!Ref subscription as you normally would while at your institution or through a proxy server login. TIP: Go to the location where you originally signed up for your account (library page, LibGuides, databases, catalog, institution resources page, etc...) PLEASE NOTE: My STAT!Ref and Temporary Login Accounts can only be created, activated and renewed while you are officially logged in through your STAT!Ref subscription. This cannot be done through or while logged in from the app or from anywhere else you have logged in using your My STAT!Ref user name and password. Step 2: Click the “My STAT!Ref” link just above the [GO] button in the search bar. Log in if necessary using your STAT!Ref un/pw. Step 3: Click the [Temporary Login Account] tab. Step 4: Check the reCAPTCHA box and answer the security question if asked. Step 5: Click the [Activate/Renew] button. From details you can view and edit your My STAT!Ref account. You can also change your My STAT!Ref password. Please note: your profile is setup to enable remote access and if you change the listed email address or password, then the new value(s) will also be what you must use for remote access. Sign up for STAT!Ref alerts. STAT!Ref provides alerts which you can sign up to receive via email or by subscribing to the RSS versions of the service. STAT!Ref Evidence Alerts cover a range of healthcare disciplines that can be chosen delivering relevant and meaningful EBM information focused on your healthcare interests, helping with your clinical decisions. Available via e-mail alerts or via the STAT!Ref Evidence Alerts RSS. Choose alert criteria within Medical, Nursing and Rehabilitation disciplines. STAT!Ref Medical News Feed, in conjunction with Reuters Health Medical News, keeps health professionals ahead of the curve with the latest key developments in the world of medicine and pharmaceuticals. Available via e-mail alerts or via the STAT!Ref Medical News Feed RSS. For subscribers of Essential Evidence Plus (EE+), Daily POEMs (“Patient-Oriented Evidence that Matters”) are e-mail alert synopses of new evidence carefully filtered for relevance to patient care and evaluated for validity. Daily POEMs emerge from continuous review, grading, and critical appraisal of all 3000+ studies published monthly in more than 100 journals. In settings, choose your default medical dictionary, the URL you go to when you logoff of STAT!Ref, how you would like to see the bookshelf tab in your STAT!Ref subscription, determine if you hide or show book covers on the search results page, determine if you show excerpts of results after a search, dictate the font size of STAT!Ref documents, hide or show images on the last searched panel and determine how many search results you would like to see on your page. You can also check a box to always open Figure, Table, and Video links in a new window. Create, activate and renew a Temporary Login Account. Why Do We Call it a Temporary Login Account? Activating the Temporary Login Account will provide the ability to login to your institutional subscription via a username (email address) and password on your mobile device, remote laptop, tablet, desktop, etc. This account will be the same as a My STAT!Ref account. The My STAT!Ref email address and password become a login account, temporarily. Temporary Login Accounts expire 90 days from initial setup, by default. Your institutions decision maker, in regards to STAT!Ref, can request to make the expiration shorter or longer from 30 days up to 365 days. 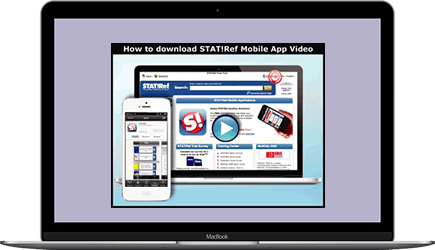 Please take a moment to check out this brief overview of Statref Mobile Video. How can I purchase STAT!Ref Mobile? STAT!Ref Mobile comes free with every STAT!Ref Online subscription. It is not a separate stand-alone application. If you have access to SR Online then you already have SR Mobile. URLs and authentication methods apply the same to SR Mobile as they do for your SR Online subscription. If you need assistance with SR Mobile please contact customer service. If your institution has a subscription to STAT!Ref you can download one of the available Mobile apps and start using STAT!Ref on your mobile today! See Mobile App information on this web page. After logging into my account it say's its unavailable. How come? Warning Message: This My STAT!Ref account was activated for logging in to STAT!Ref under a different subscription. If you need to use this account with a new subscription, please contact technical support for assistance. This happens occasionally if your institution has or has had access to more than one STAT!Ref subscription. Subscriptions are identified with a unique group alias in all URLs "grpalias=#######". Your My STAT!Ref account is associated with the grpalias that you were connected to when you originally created your account. If you've received this message then you have accessed STAT!Ref through a URL with a different grpalias, one that is not associated with your account. Please call or email support with the email address you signed up with and the name of the institution as it appears at the top of the screen when you are logged in to STAT!Ref. We can find and move if necessary your My STAT!Ref account to the appropriate subscription. I logged in to renew my account but it won't let me. How come? Warning Message: You are currently logged in to STAT!Ref using a My STAT!Ref account. You cannot activate or renew a My STAT!Ref - Temporary Login account for logging in to STAT!Ref while logged in through a Temporary Login Account. Please refer to the How to Create, Activate, and Renew a login for the App section by clicking here. The My STAT!Ref - Temporary Login Account; someone@gmail.com expires on mm/dd/yyyy. You will not be able to use it for off-site access after that date unless you re-activate it from the My STAT!Ref Temporary Login Account page. Solution: To protect a subscription from unauthorized use, it is required that users re-authenticate their My STAT!Ref Temporary Login Accounts prior to expiration by logging in to their My STAT!Ref account while either IP authenticated, with a Full User login (not all subscriptions are setup with full user accounts) or by accessing via a proxy server. After accessing the account just click the Temporary Login Account tab and click the [Activate / Renew] button. Can a Temporary Login Account be renewed even after it has expired? Yes, you can still renew even if your login expires. You just won't be able to use the app until you renew the Temporary Login Account. Please refer to the How to Create, Activate, and Renew a login for the App section by clicking here. Can I use the Temporary Login Account for more than logging into the app? You can use your Temporary Login Account from any device (Desktop, Laptop, Tablet or Smartphone) with a modern browser and an internet connection. Just go to either: the public STAT!Ref website or the subscription website and log in. How do I change my email address, name or password? If you need to change your email address, name, password, etc... you can do so through your My STAT!Ref account. 2. Click the My STAT!Ref Link and login if necessary. 3. Click Details tab and edit your information. Here's what to do if you forget your password. Access STAT!Ref and click on the My STAT!Ref link. You will be taken to the login details page. I created a My STAT!Ref account but my un/pw doesn't work on the app. Why not? You successfully created your account but you probably did not activate it to use as a login. A My STAT!Ref account allows you to set up Evidence Alerts, News Feeds, track your searches and much more. Next, launch the app on your device and enter your un/pw. Check to save the log in info if you don't want to log in each time. Thank you for putting together such a user-friendly website. It's extremely instinctive and easy to use. Thank you for making research much easier! Stat!Ref is outstanding. Your program has been an invaluable resource for my care plans and drug research. We love it and have used it for years–you emphasize books that are primarily used as reference texts and those are the best type for online access. I am a pharmacy student at Butler and I am finding your database particularly useful in my class on clinical assessment. Having the integrated Stedman's medical dictionary has been a great tool or working on defining new terminology, completing pre-lab activities, and preparing for lab sessions. The interface is very user-friendly for the whole site and it is one that I am sure I will be using regularly as I move through the pharmacy program. I find Stat!Ref to be my go to online reference. I no longer need to buy textbooks or keep my office cluttered with them.